When the exhausted Sun takes up his cycle then my prophecy and threats will be accomplished. 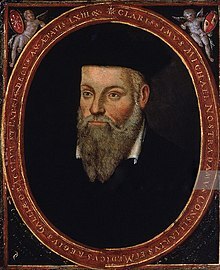 Michel de Notredame or Michel de Nostredame (14 December 1503 – 1 July 1566) was a French physician, astrologer, occultist and author of almanacs, most famous for his book Les Propheties; known primarily as Nostradamus, the latinization of his given name. I had determined to go as far as declaring in abstruse and puzzling utterances the future causes of the "common advent", even those truly cogent ones that I have foreseen. Yet lest whatever human changes may be to come should scandalise delicate ears, the whole thing is written in nebulous form, rather than as a clear prophecy of any kind. Tomorrow, I shall no longer be here. The Prophecies, often referred to as the Centuries there are numerous translations and interpretations of these verses. If I have eschewed the word prophet, I do not wish to attribute to myself such lofty title at the present time, for whoever is called a prophet now was once called a seer; since a prophet, my son, is properly speaking one who sees distant things through a natural knowledge of all creatures. And it can happen that the prophet bringing about the perfect light of prophecy may make manifest things both human and divine, because this cannot be done otherwise, given that the effects of predicting the future extend far off into time. Perfect knowledge of such things cannot be acquired without divine inspiration, given that all prophetic inspiration derives its initial origin from God Almighty, then from chance and nature. Since all these portents are produced impartially, prophecy comes to pass partly as predicted. For understanding created by the intellect cannot be acquired by means of the occult, only by the aid of the zodiac, bringing forth that small flame by whose light part of the future may be discerned. We need god to prosper those without him will not. Fait prosperer qui n'est à croire vain. This page was last edited on 25 January 2019, at 20:53.